Pay out again from Neobux. I got my first pay out from Palmbux today. I felt that it was a beautiful action by a PTC site. The reason to feel so was the loss incurred by many sites recently. After months of clicking the ads and waiting, when I requested, those sites disappeared or changed their TOS. So I had a fear about Palmbux also. When I reached the pay out limit, I just placed the withdrawal request. Then a dialogue box opened and said that being the first pay out it is required to verify my account and I have to wait about 7 days for that. But on the third day itself I noticed that my account is verified. Then I clicked on the 'Withdrawal Tab' and instantly the amount $2.01 accounted in my Alertpay account. A beautiful 'Instant Payment'. 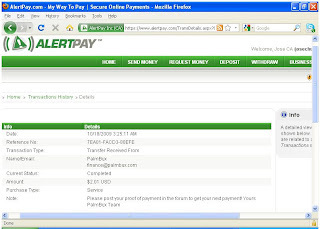 I am very happy to say that Palmbux is a legit site and you can trust that site. I am giving the pay out proof image below. Deewali is a festival in India to commemorate the victory of goodness over evils. There are many versions of stories connected with this event. It is considered as the festival of lights also. 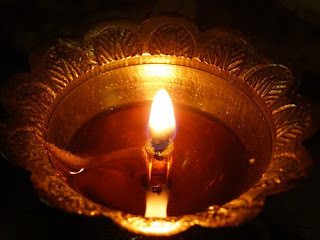 On this auspicious occasion , I extend the Happy Deewali wishes to the all the concerned. I was thinking to write few words about Idea Star Singer 2009, a TV program, from few days back. It was at the occasion when they felicitated their 100th episode with the children affected by cancer at the Regional Cancer Center at Trivandrum. The program organizers Idea Cell Phones and Asianet Communications deserves our gratitude. The well known singers Chithra, M.G. Sreekumar and music director Sarath along with the budding singers mingled with the 'buds of sorrow' and tried to share their sympathy and love. The Star Singer program itself is wonderful. This special episode added a diamond on their crown, no doubt.